Killultagh Vic was the first high-profile Irish horse to miss Cheltenham with injury but you can be sure he won’t be the last, writes Tony Keenan. We are in that horrible space between the conclusion of most of the trials and the start of the Festival where owners, trainers and, yes, punters live in terror of hearing that their horse will miss the meeting with a late setback. It makes sense that injuries should occur at this time. No more than a human athlete getting ready for a career-defining event, the revs are being cranked up to the max in preparation and it is inevitable that a gasket or two will blow in the process. Some trainers has succeeded more than others in avoiding – or preventing – the last-minute injury; Willie Mullins stands out in terms of getting his Cheltenham horses to end point and punters can rightly have faith in backing one of his runners ante-post at a short price in the relatively safe assumption that they will get to post. But other handlers have not been so fortunate (though perhaps fortunate is the wrong word as it is surely a skill to keep horses sound). Predicting which trainers’ runners will make or miss Cheltenham by looking at data is difficult if not impossible and it makes more sense to look at a more global sense of how successful they are in keeping their horses sound from season to season. 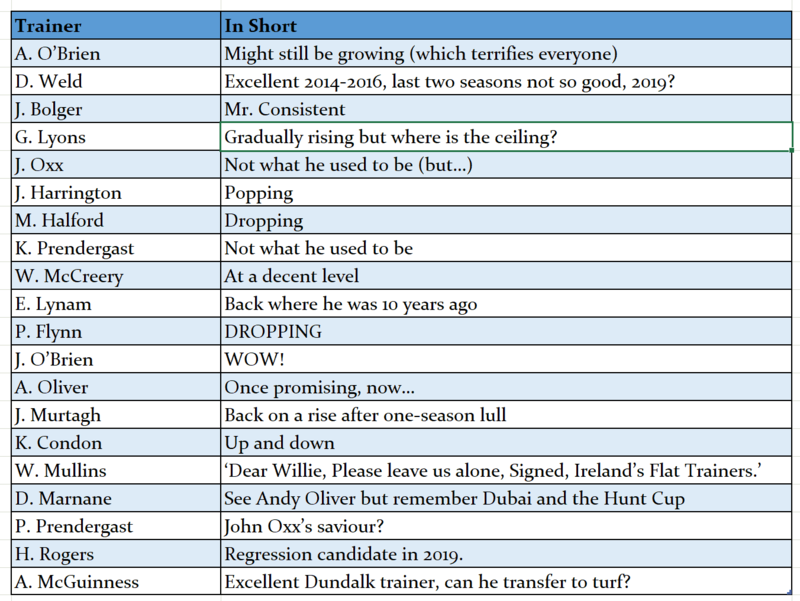 In the table below, I’ve focussed on the top 15 Irish trainers in terms of winners sent out in the six seasons from 2009/10 to 2014/15, leaving out those who are no longer training, i.e. Dessie Hughes and Charlie Swan. 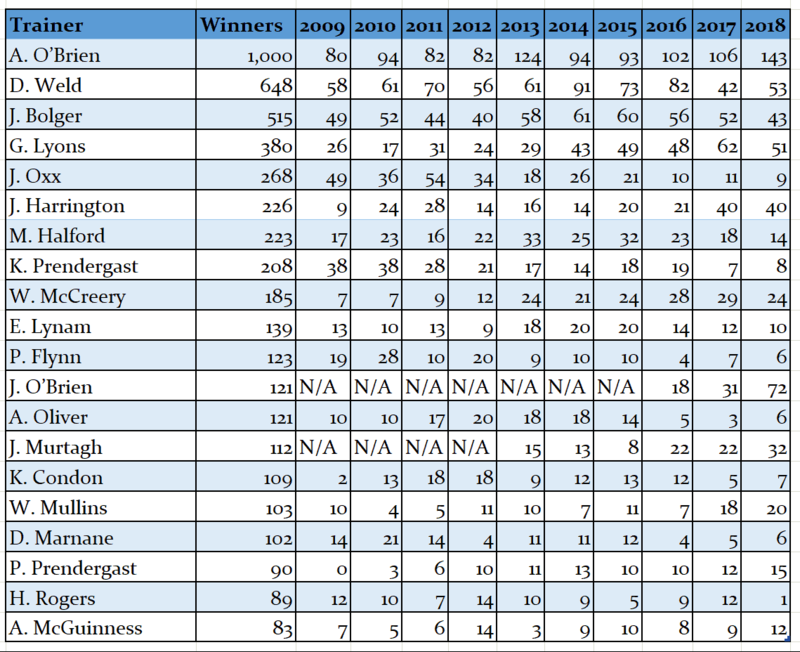 I found every horse they had in that period that acquired an Irish official rating of 130 or more and went through their racing career in totality regardless of whether it began before 2009 or continued beyond 2015. I was looking for how many ‘full seasons’ they had in their careers and I took a very loose definition of what a full season was: a season in which a horse ran twice or more in the Irish National Hunt campaign which takes the Punchestown Festival as its start and end point. To my mind, this is quite a lenient definition of a full season – many owners would want their horses to run far more regularly – but I was giving trainers the benefit of the doubt and I didn’t penalise for a horse only running once in their first season as trainers often want to start them off slowly. With the number of full seasons and missed seasons I worked out a figure called ‘attrition rate’ which expresses as a percentage how often a trainer’s horses miss a season in relation to their career as a whole. Take Tony Martin as an example. In the period covered, he has 131 full seasons from his 130-plus rated horses and six missed seasons; I add the two together to get a total season figure which is 137 and then divide the missed season number into it to leave an attrition rate of 4.4%. 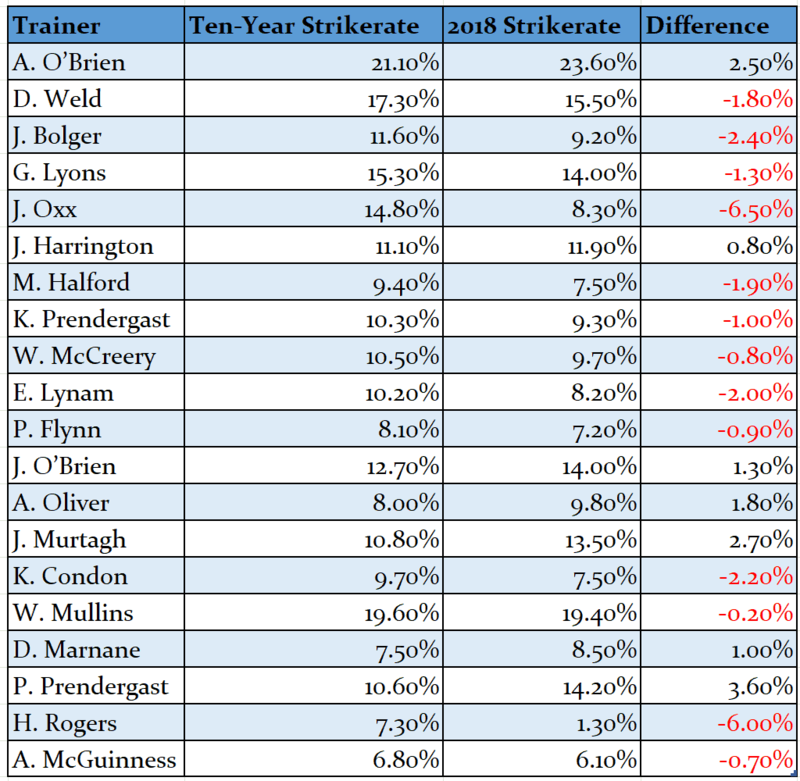 As a back-up figure, I also added in how many runs a trainer’s horses averaged per season over that period. This methodology is far from perfect. Firstly, it looks only at horses rated 130 or more, but the data was so overwhelming that were I to look at them all I’d struggle to have it finished for Cheltenham 2017! It also supposes that every National Hunt horse threads the same campaign trail, starting its season in the autumn and running through to the late spring/early summer. This is not the case with summer jumpers and many horses will have a winter break to avoid the worst of ground. Using my method, horses could miss two calendar years but only one racing season. Monksland, say, missed 730 days between December 2012 and December 2014 but raced three times in the 2012/13 season and the same in 2014/15 campaign so is only penalised for being absent in 2013/14. Furthermore, trainers are not penalised for horses having a short career of a season or two but they are hit for getting a horse back off an absence of a season or two for just one run, despite the fact that this could be a major achievement if that horse has had serious problems. Despite all this, I think there is enough in the data to make it interesting to look at, if not necessarily of vast predictive value. We’ll start with Willie Mullins as we generally do. He has a highish attrition rate and the lowest average season runs so comes out quite badly on these numbers though I doubt Rich Ricci, Graham Wylie et al will be moving their horses in light of them! In fairness, he has improved recently with most of his absentees coming in the early part of the period covered though it must be said that he has quite a few horses that are in danger of missing this campaign, the likes of Abyssial, Jarry D’Honneur, Champagne Fever and Analifet all on the easy list at the moment. Charles Byrnes has a very high attrition rate, 5.6% higher than the next highest, so perhaps landing gambles takes its toll! His achievement in bringing the nine-year-old Solwhit back to win at Cheltenham and Aintree in 2013 was a notable one but it seems significant that so many of his best horses have missed chunks of time, the likes of Mounthenry, Pittoni, Trifolium, Weapons Amnesty and Our Vinnie all having stop-start careers. Colm Murphy is another that comes out poorly on the numbers, having not only a high attrition rate but also a low average runs per season, though the reason behind this could be one discussed in a previous article of mine on fall/unseat rate where he came out as one of the highest in the country. Falls and unseats will clearly cause plenty of injuries. One trainer who does quite well is Gordon Elliott, his horses generally sound and running often, and it needs to be pointed out that he gets quite a few stable switchers. That can be viewed positively or negatively; either someone else has done all the hard work or you have to rectify another trainer’s mistakes. Noel Meade is having a torrid season in terms of injuries, with Road To Riches having a curtailed campaign and Apache Stronghold out for the year. His attrition rate, third overall, would suggest this is not uncommon. One thing to admire with Meade is that no one else comes close in terms of openness around his horses’ health and he must be praised for that. In terms of positives, Jessica Harrington stands out as having a low attrition rate and a high average number of runs. I would put this down to two things: she tends to mix flat and jumps campaigns, the former clearly less attritional than the latter; and she will often give her horses mid-winter breaks to avoid the worst of ground, something she frequently references in stable tours. Edward O’Grady has the name of being hard on his horses but the numbers suggest otherwise, coming in the equal of Harrington in attrition rate. Henry De Bromhead has relatively a low attrition rate too, albeit with not many average season runs, and tends to do well in keeping older horses sweet. Sizing Europe is the daddy of them all but the likes of Sizing Australia and Darwins Fox are further feathers in de Bromhead’s cap. Finally, mention must go to Michael Hourigan. His attrition rate percentage is only average but he is brilliant in terms of getting runs into his horses, his average of 7.3 a full run per season better than anyone else. I won’t say his horses are always in form but at least they’re out there competing and it is notable that eight of his 16 horses rated 130 plus raced at least 30 times. There are some real heroes in there like Dancing Tornado and Church Island and of course A New Story who ran an amazing 110 times, often over staying trips, and was still racing at fifteen. Just six months ago, Jessica Harrington was celebrating one of her greatest achievements in training, when Jezki won the Champion Hurdle at the Cheltenham Festival. As one of Ireland’s leading National Hunt trainers, she has won many major prizes at high-profile meetings over the past 15 years. There can be little doubt that Moscow Flyer helped put the Co. Kildare trainer on the map. His exploits as a two mile chaser place him among the all-time greats. 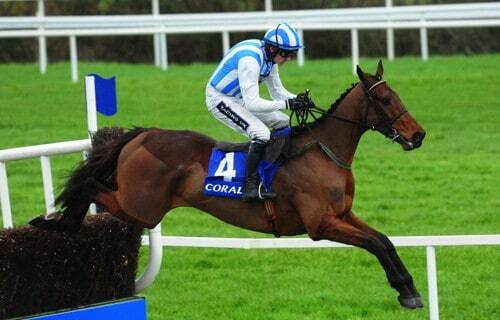 His stunning victories included two Queen Mother Champion Chase successes at the Cheltenham Festival. 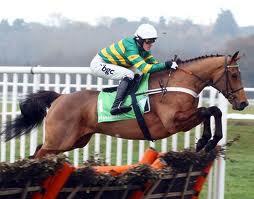 Further major wins have come with talented horses such as Macs Joy, Cork All Star, Boston’s Angel and now Jezki. The latter looks set for another terrific winter campaign. Though clearly overshadowed by their winter exploits, the Commonstown Stables have had their share of success on the flat. Pathfork remains Jessica’s highest profile flat winner, when achieving Group 1 success at the Curragh in the Vincent O’Brien National Stakes in 2010. 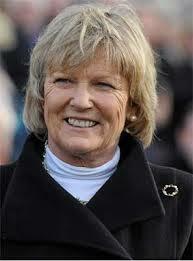 She also trained Laughing Lashes and Curtain Call to Group 2 victories in 2010 and 2007 respectively. However, the latest stable star was felt good enough to take her place at Longchamp this weekend, and thereby become the stables first runner on Arc day. On Saturday morning Jessica kindly took a minute to inform me; “I have never had a runner on Arc day, and so I am very excited.” For someone who has accomplished so much at the great festival meetings of Punchestown and Cheltenham, such excitement goes to show what a momentous achievement it is to train a horse for the greatest flat meeting in Europe. A two-year-old filly named Jack Naylor was the reason Jessica Harrington spent Sunday in Paris as opposed to a trip to Tipperary. Not that spending a Sunday in Tipperary would be anything other than a wonderful experience. The young filly is named, in part, after the rather unscrupulous TV character in Holby City, but also after the owner’s grandson Jack. By Champs Elysees out of a Nashwan mare, she has made dramatic progress since her fifth place in a Leopardstown maiden back in May. Impressive wins in a Group 3 at Leopardstown before a listed event at the Curragh, helped book her place in the Group 1 Prix Marcel Boussac. And what a race she ran. 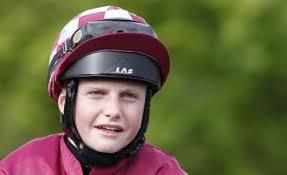 Prominent from the start, she was unable to match the finishing burst of the Aidan O’Brien trained Found. With the French filly Ervedya taking second, she stayed on well for a terrific third place. 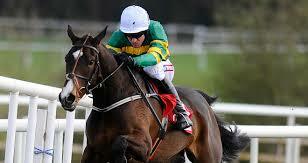 Her pedigree suggests that a step up in trip next season would bring further improvement. There’s little doubt that Jessica Harrington’s faith in her exciting filly has been completely justified, and the trip to Longchamp has been a major success for all concerned. As the trainer’s focus inevitably shifts towards a thrilling jumps campaign that lies ahead, she will no doubt take great satisfaction on a successful summer campaign. The trip to Paris is sure to have given Jessica a taste for further great days in the flat seasons to come. Jack Naylor looks sure to play a key role in any such adventures.